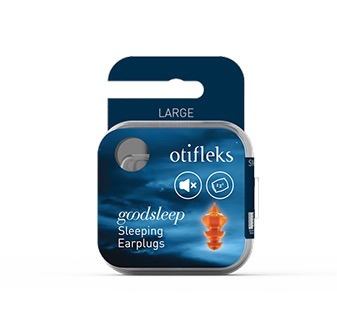 The GoodSleep, without question, is the cutting edge of sleeping earplug designs. 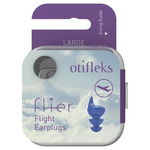 It is the premier earplug available worldwide to combat noise related sleeping problems. A sleeping earplug demands a small profile whilst providing maximum comfort and sound blocking ability. Traditional silicone/wax sleeping earplugs gather lint and other impurities whilst sleeping. This is definitively unhygienic and uneconomic in the long-term. Foam earplugs employ a one size fits all policy either too small for effectiveness, or too large and incredibly uncomfortable. 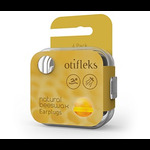 Otiflex earplugs are produced from thermo-reactive elastomer: a soft, flexible material that matches your body temperature within 4 minutes, conforming to the unique bends, turns, bumps and twists of each individual’s ear. Utilizing the latest findings in ergonomic design and harnessing the power of thermo-reactive elastomer, the minimalist size of the GoodSleep leads to maximized comfort, blocking sound whilst you sleep.